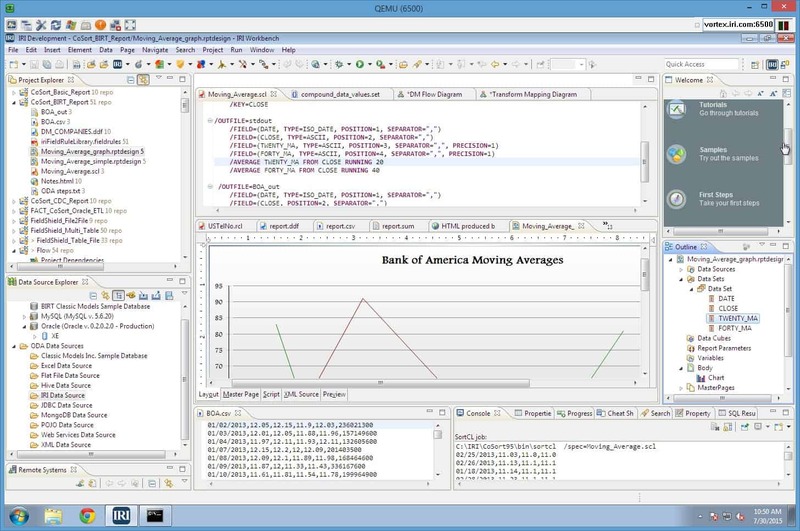 Business Intelligence Reporting Tool (BIRT) is the free, open source reporting system built on Eclipse™. Millions of developers use BIRT worldwide. IRI collaborated with OpenText to combine IRI CoSort data preparation with free or commercial BIRT visualizations in Eclipse. 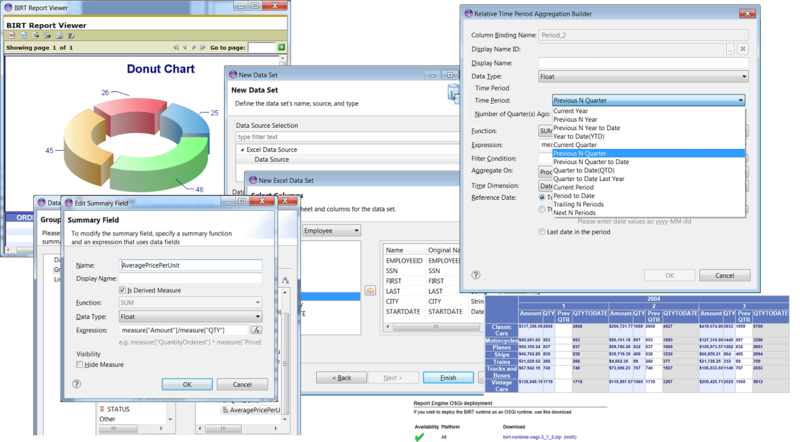 BIRT works directly with the CoSort SortCL program in the same Eclipse GUI to produce powerful reports from immediate fit-for-purpose data sets. This dynamic integration provides for seamless metadata exchange and data flows for end-to-end data preparation and presentation -- from SortCL to BIRT. For more information, see this announcement and this section. Now you can easily and quickly prepare data for BIRT reports without leaving Eclipse, or resorting to a database, Hadoop , third-party ETL or expensive data blending engine. The SortCL program inside the IRI CoSort data transformation product or IRI Voracity data management platform feeds data and metadata directly into BIRT at reporting time so you can focus on data presentation, not preparation. 1. preparation job in the IRI Workbench where BIRT is running. In the SortCL script, your first target definition section must specify /OUTFILE=stdout so the BIRT report will use the standard output of SortCL as its "IRI Data Source. 2. Ensure that all /OUTFILE fields included in your report also specify supporting fields. For example, include the /SUMMARY fields so their formatted fields get populated with aggregate values. 3. Tell your BIRT report template to use the output fields named in the stdout section of the SortCL script, so those values feed the display. BIRT can also perform further calculations on the SortCL results, if necessary. Open Data Access (ODA) allows BIRT and IRI CoSort's SortCL data transformation (and masking) program to communicate at reporting time. Through the ODA connection, BIRT reads and runs the SortCL script of your choice so you can create reports and charts of endless design possibilities. This diagram shows the basic flow of data from the original file through SortCL and to BIRT. The sample reports below both used the same input data and a Voracity or CoSort SortCL job script. 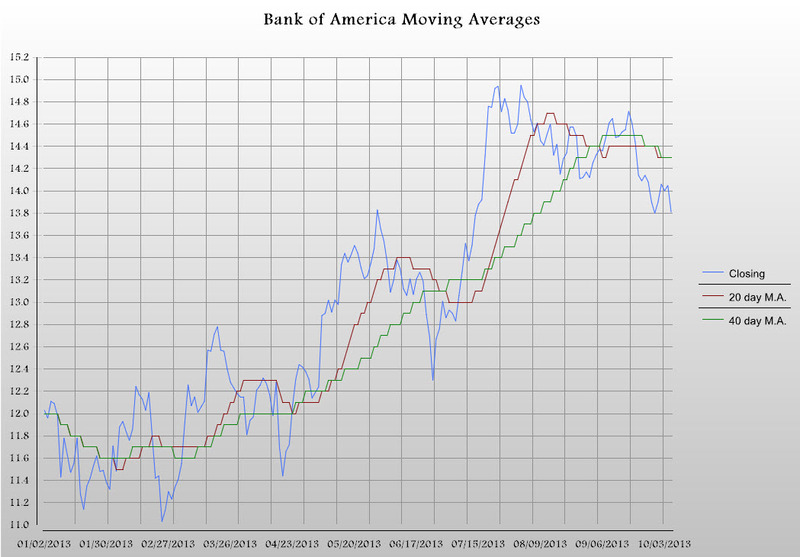 The source data was the closing prices for Bank of America stock in September 2013. Windowed aggregate lag functions in SortCL were used to create 20-day and 40-day moving average intersections. Moving standard deviations are also supported. and design it all in the same pane of glass, built on Eclipse. The enterprise-grade software allows users to extract more information from their data. You can leverage the extension to create hundreds of HTML5-powered charts, maps, and perform impact analysis.